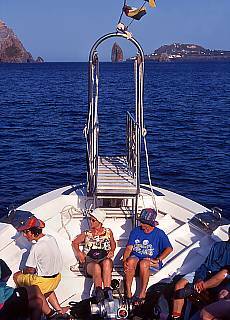 The Aeolian Islands are easily accessible by ferry boat or Aliscafi (speed boat) from Naples, Milazzo, Messina and Palermo. Beautiful deepblack glossy Obsidian stones you can find in the snowwhite pumice stone mountains of Campo Bianco at the northeast top off Lipari. Obsidian is liquid, to Glas congealed Lava deep out of the inner earth. Since 6000 years before Chr. Obsidian was used because of his grade and sharpness for tools and weapons (knife, spearhead) . Today Obsidian is more and more used for custome jewelry, mainly in combination with Silver. Attention when hicking in the spoil piles of pumice - you may slide, do not breathe the acidly pumice dust or contact it with your eyes. Scheduled bus service from the major port of Lipari, Marina Lunga, to Canneto (runs approx every hour). Get off the bus at the end of the village and then walk down through the village P. di Sparanello and further on along the coastal trail. Stairs lead down to Spiaggia Bianca beach. 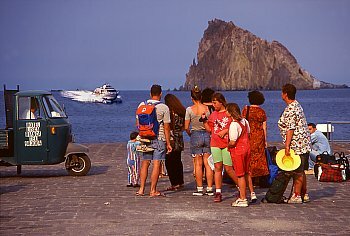 Scheduled bus service (URSO) from Lipari to Pirrera. Walk through the vineyards along the Forgia Vecchia via Culia down to Canneto. Scheduled bus service (URSO) from Lipari to Lami. Hiking first along the Fossa Castagna, then the pumice stone mountains down to Acquacalda. 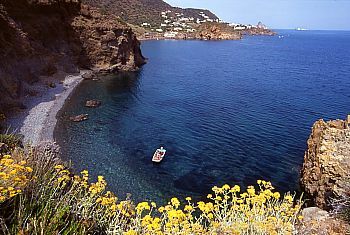 With a (fishing) boat from Lipari small harbor Marina Corta drive to the beautiful beach Sponda di Vinci drive (only reachable by sea). To avoid unpleasant surprises, negotiate the fare for the tour and the pick-up time for the return trip in advance. 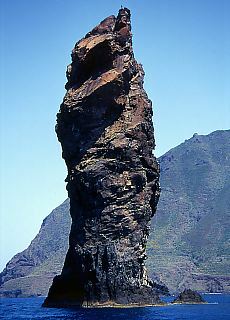 Be sure to make an additional trip to the bizarre rocks like the needle Pietralunga in the strait between Lipari and Vulcano. Ride by bus in the late afternoon to Quattrocchi (direction Quattropani). 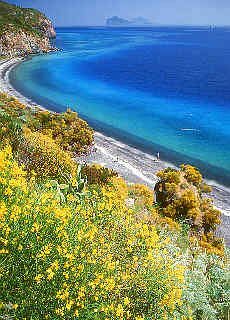 Breathtaking panoramic views of the strait between Lipari and Vulcano. Along the main road towards Lipari after approx 500 m turn right. 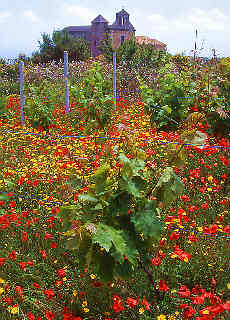 Walking through the vineyards passing the Valle Murra in direction S.Bartolo al Monte. Magnificent views downto the castle of Lipari. In S. Anna steep descent to the old town of Lipari. Lipari is dominated by an impregnable fortress with massive defensive walls. 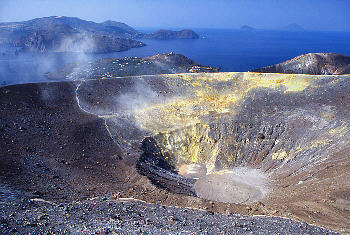 The story of Lipari goes back to the 5 Millennium BC. Obsidian stone was once a very valuable raw material for producing knives and arrowheads. 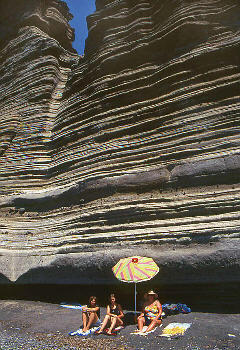 Even Odysseus stranded on the steep shores of the Aeolian Islands. Either take the bus (URSO) or better rent a scooter (motor bike). Driving on the highest elevation of Lipari, the MS Angelo (594 m). Magnificent views of the other islands and the sea (already refuel your scooter in Lipari, since there is no gas station in Quattropani). 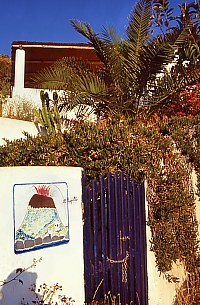 Stromboli is a well maintained village with white houses and beautiful gardens. 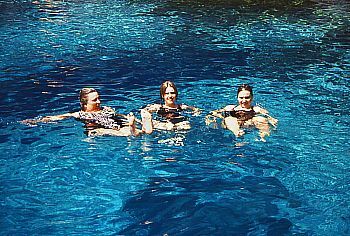 You can swim in the district of San Bartolo on the pitch-black lava beach. In the narrow streets only the for Italy typical three-wheeled small vans are allowed to drive. A good observation post for the nightly fire magic is the Trattoria at the old navystation Punta Labronzo (ca 30 walking minutes from Stromboli's Ortsteil San Bartolo away). 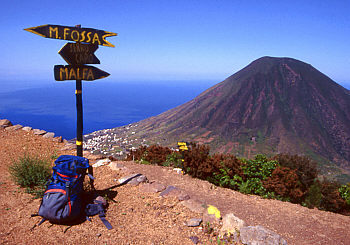 Here the path to the 926 m high Stromboli mountain top starts. For the walking to the volcano summit on late afternoon you should calculate 3-4 hours of hicking. Clowds, fog and wind, witch blows the vulcanic gases to the observation points, change the mountaintop region in a few minutes into a toxic steamkitchen, where the navigation is very difficult or entirely impossible. All 20 min until to 1 hour the Stromboli throws out a fire fountain into the starry night sky as a grandiose spectacle. 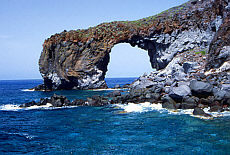 For this, Stromboli belongs to the activest and most dangerous volcanos of the world. Ride with the bus from Rinella to the pilgrimage church Madonna del Terzito in the Valley of Valdichiesa (300 meters elevation saved). 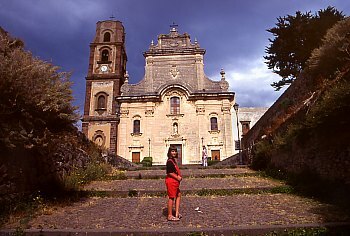 Just behind the Pilgrimage Church Valdichiesa starts the approximately two-hour ascent to Monte Fossa delle Felci, first in steep switchbacks, then in a broad flat forest trail. Early in the morning the path is still in the shade of huge pine trees. In the summit area very nice fern vegetation, magnificent view to the opposite Monte dei Porri the islands Filicudi and Alicudi and in clear air also the Snow covered Aetna in Sicily. Descent through Little Red Riding Hood fairy tale forest downto Santa Marina Salina on the opposite side of the island. The trail is very steep and tiring (about 3 hours walking, almost 1000 meters in altitude), do not forget sticks to support the walking downhill. Before about 13,000 years exploded a crater of Monte dei Porri with unimaginable violence and created a grand amphitheater. 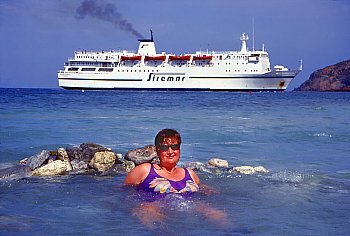 We take the ferry from Lipari to S. Marina Salina (departure in Lipari 9.30 o'clock, return 16.45 o'clock), then the public bus via Malfa downto Polara. The winding road down to Polara by classical music is a grandiose adventure and affords the highest demands on the brakes of the bus (Iveco). Starting at the port of Vulcano leads of the almost one hour path over sparsely vegetated ash slopes up to the crater rim. 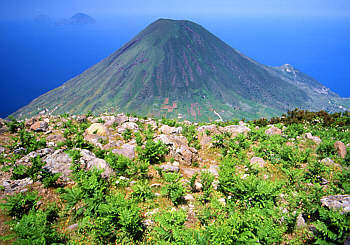 A circular trail on the crater rim (highest point 391 m) provides magnificent views into 200 m deep crater bottom, to Vulcanela, Lipari, Panarea and Stromboli. You can quickly walk through the hot sulfur clouds, but You should nothing breathe from the corrosive and toxic vapors. 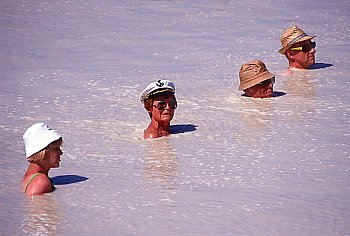 We then jump into the natural whirlpool in the sea. From the seabed boiling hot steam bubbles are rising up and massage our maltreated back. 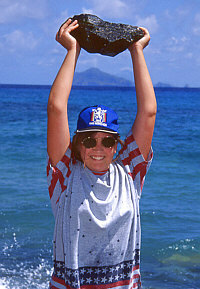 A cure of the health insurance company can not act better. In the background the huge Siremar ferry just turns towards Milazzo. 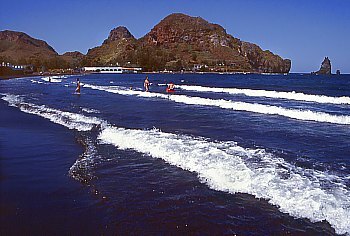 Fine black lava sand in the bay of Porto di Ponente (at the Hotel Les Sables Noirs loungers for hire) invites us to take a bath. Short hike (45 min) to the Valley of the monster on the small island Vulcanella. The bizarre lava formations look like dinosaurs. Trip to the crater rim of Vulcanello. From San Pietro we walk through the district Drauto in about 1 hour passing the stunningly beautiful beach Caletta dei Zimmari on the way to Capo Milazzese. Situated on a plateau still are the foundations of a settlement from the Bronze Age. An impressive natural harbor with crystal clear water offers protection to expensive sailing yachts of the super rich people. Waiting at the port on the Aliscafi to Lipari, in the background the small rocky island Basiluzzo. Daily at 21 o'clock the Siremar ferry boat starts in Naples to their nightly tour through the Tyrrhenian Sea. 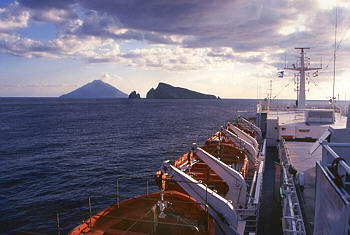 At 5 o'clock in the morning the Siremar ferry boat reaches the island Stromboli. From the deck of the big ship you can see the lava fire fountains of the active volcano very well. The journey continues to the Eolian Islands Panarea, Salina, Lipari (circa 11 o'clock) and Vulcano. Last stop is the harbour of Milazzo in Sicily. 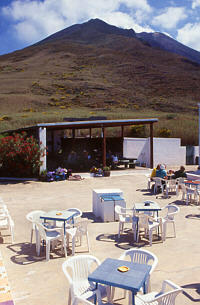 The smallest harbor in the Eolian islands, the large Siremar ferry can't dock in. 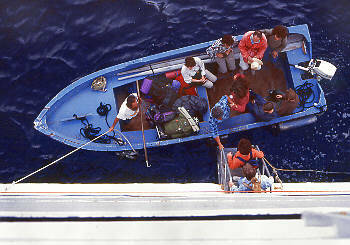 Passengers are picked up by a small motorboat, sometimes a rowing boat. 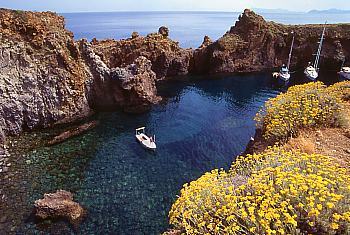 From Catania airport in Sicily departs daily at 16.00 o'clock a shuttle bus to Milazzo harbor. 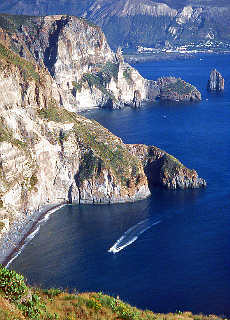 From there by speedboat (Aliscafi) or ferry to Lipari or Vulcano islands. Locals which offer apartments and rooms to let, wait on the arrival of ships in the harbor for guests. Here you will quickly find a cosy accommodation. During the months of March, April and October significantly fewer vessels and speedboats are operating. In a heavy storm these ferry boats can stop working (especially the Aliscafi's are very sensitive to wind).